Campus Tour Registration will be unavailable due to scheduled maintenance from September 23 at 5:00 A.M. until 11:00 A.M.
Summer break for Auburn University is May 7-16, 2018. We will not be providing campus tours during this time, but the Office of Undergraduate Admissions will be open from 7:45 a.m. to 4:30 p.m. daily. If you are interested in visiting Auburn University during this week, please park on the 4th level of the Stadium Parking Deck at 350 Duncan Drive and follow the campus tour signs to the Quad Center where you can pick up a self-guided tour brochure and speak with an Admissions Advisor. You may also download a copy of the Self-Guided Tour Brochure if you are touring Auburn’s campus after hours. Summer break for Auburn University is May 6-15, 2019. During this time we will not be providing campus tours, but the Office of Undergraduate Admissions will be open from 7:45-4:30 p.m. daily. If you are interested in visiting Auburn University during this time, please park on the 4th level of the Stadium Parking Deck located at 350 Duncan Drive and follow the campus tour signs to the Quad Center where you can pick up a self-guided tour brochure and speak with an admissions advisor. The Office of University Recruitment campus tour begins with an information session followed by a walking campus tour. The information session includes academic highlights of Auburn University as well as the admissions process, scholarships, and the Auburn community. The 75-minute walking campus tour, led by a Student Recruiter, will focus on Auburn’s history, tradition, and student life. Our campus tour does not include the following: Housing Tours, Recreation and Wellness Center Tours, tour of the library building or an inside view of classrooms. If you are flying into the Atlanta Airport, there will be a time change from Eastern Time to Central Time when driving across the Georgia-Alabama state line. Tours are offered Monday through Friday except on University holidays. Due to space limitations, if a particular tour date or time is full it will not allow you to choose that date and time. Please select a date and time that is available to be guaranteed a campus tour. The Office of Undergraduate Admissions encourages families to make the most of your visit to campus. If you would like to meet with someone in an academic area, we strongly recommend that you make an appointment with the department before you arrive on campus. To contact your college or school for an appointment, please click on the Academic Department Visits tab for contact information. Most departmental visits last approximately 30 minutes. Guest Parking is located on the Top Level Only of the Stadium Parking Deck located at 350 Duncan Drive, Auburn, AL 36849. Please click on the Parking/Travel Information tab for more information. You are more than welcome to explore campus on-your-own with our Self Guided Tour (PDF). Need to Change or Cancel your tour? Please call 334-844-6425 to reschedule or cancel your tour. By making these changes in advance you will assure the availability of the date you would like to visit and free up times for other guests wishing to visit. The Office of Undergraduate Admissions will be offering Saturday tours on the dates shown below for Spring 2019 semester. Tours include an information session led by an admissions advisor followed by a walking tour of campus led by a student recruiter. All campus tours are on Central Time. If you are flying into the Atlanta airport there will be a time change from Eastern to Central Time when driving across the Georgia-Alabama state line. Due to space limitations, if a particular tour date or time is full it will not allow you to choose that date and time. Please select a date and time that is available to be guaranteed a campus tour. Parking is available in the Library Parking Deck, Comer Parking Lot or the Stadium Parking Deck. This walking tour will take you to Broun Hall in the Quad housing to preview a suite-mate housing option then you will walk to Aubie Hall in the Village to preview an apartment-style housing option. After touring the Village Housing, an optional tour of the Recreation and Wellness Center is offered to show all the amenities of this facility. This tour departs from the Quad Center and takes approximately 30 minutes to tour both of the housing options and another 30 minutes to walk over and tour the wellness center. Please read our FAQs to learn additional information for Saturday Tours at Auburn University. To reschedule or cancel your tour please call 334-844-6425 or email us at visit@auburn.edu. By making these changes in advance you will assure the availability of the date you would like to visit and free up times for other guests wishing to visit. Group tours are offered Tuesday, Wednesday, and Thursday. All tours are on Central Time. This tour is designed for large groups of high school students grades 10th – 12th or college-aged students who are visiting campus together. Large groups range from 9 to 50 prospective students, although groups of 30 or less will have a better campus tour experience. Group tours can also be arranged to include an information session with an admissions advisor. Please read our Frequently Asked Questions to obtain additional information on policies and procedures for Group Tours at Auburn University – Thank you. To inquire about bringing a Group Tour, please email us. Tours of Auburn’s residence halls are available Monday through Friday, except on University holidays. Allow yourself approximately 10 to15 minutes to walk to each housing location you would like to view on campus. All tours begin promptly at the times designated and last approximately 20 minutes at each location. Tours will proceed if rain is light to moderate and are cancelled during severe weather, or if severe weather is predicted. If you have additional questions about on-campus housing, please contact the University Housing and Residence Life office at (334) 844-4580 or email housing@auburn.edu. 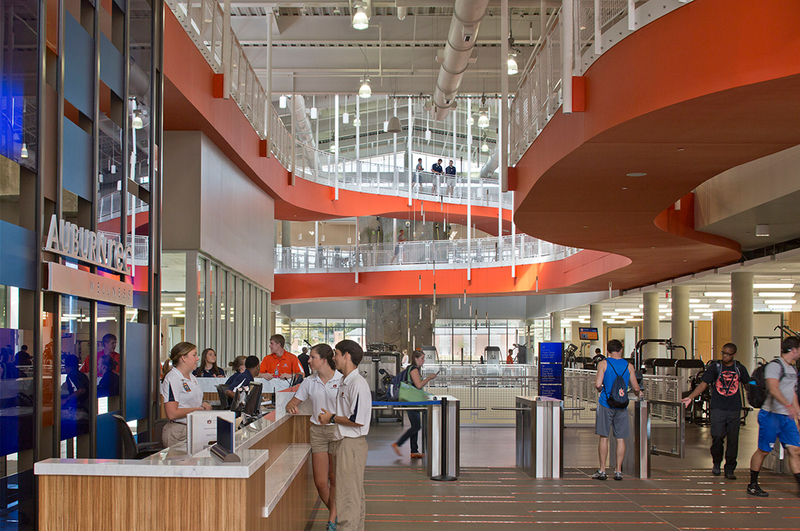 For more information about the Recreation and Wellness Center, please visit auburn.edu/campusrec. Take a tour of the Recreation and Wellness Center at your convenience on the day of your visit. Tours are offered every 15 minutes, starting at the top-of-the-hour, Monday through Friday from 7:00 a.m. - 8:00 p.m., Saturday from 10:00 a.m. - 8:00 p.m. and Sunday from 12:00 p.m. - 8:00 p.m. This tour takes approximately 20 minutes to complete. The Office of Undergraduate Admissions encourages families to make the most of your visit to campus. If you would like to meet with someone in an academic area, we strongly recommend that you make an appointment with them BEFORE you arrive on campus. Find the college or school which holds your major. The College of Agriculture provides a variety of programs to host prospective students and their families. Most events include an informational session, tour with an Ag Ambassador, and a student services advisor meeting. If you would like attend a program, please register. The College of Architecture, Design, and Construction (CADC) offers informational meetings and tours daily. To schedule a tour or meeting please contact their recruiter, Katherine Buck, at katherine.buck@auburn.edu or (334) 844-4569. Tours of the Harbert College of Business are available by appointment, Monday through Friday from 9:00 am -3:00 pm, and are led by current Harbert students. To schedule a tour, please contact Becca Grace at beccagrace@auburn.edu or (334) 844-7891. The Samuel Ginn College of Engineering will offer engineering tours Monday-Friday at 10 AM, 11 AM, and 12 PM. Group information sessions led by engineering staff will be held at 11:00 AM Monday-Friday. Summer tours will begin on May 17. Please register here for a tour of the Samuel Ginn College of Engineering. The Samuel Ginn College of Engineering offers engineering tours Monday-Friday at 10:00 AM, 11:00 AM, 12:00 PM, 1:00 PM and 2:00 PM. Group information sessions for engineering are given at 11:00 AM Monday-Friday. Please register here for a tour of the Samuel Ginn College of Engineering. To learn more about what the College of Liberal Arts has to offer during your visit to campus, please register here for an appointment for an appointment with the College of Liberal Arts. To learn more about Auburn Aviation, we invite you to visit our campus and facilities. Aviation tours are led by our Striped Wings Student Ambassadors on Mondays and Fridays at 9 a.m. and 2:30 p.m. Visitors meet with aviation faculty and staff to learn more about aviation programs, career opportunities, and tour aviation facilities. To schedule a tour register here. While you are walking around our campus, do not hesitate to speak with anyone you encounter – they’ll be happy to tell you what makes Auburn such a special place! If you are unable to participate in a student-led campus tour, you may enjoy a virtual tour at any time. It provides a 360-degree view and an audio description of select areas on campus. Guest parking is on top level of the Stadium Parking Deck only. When planning your visit please allow at least 20 minutes park your vehicle, walk to the Quad Center and check-in at the front desk. 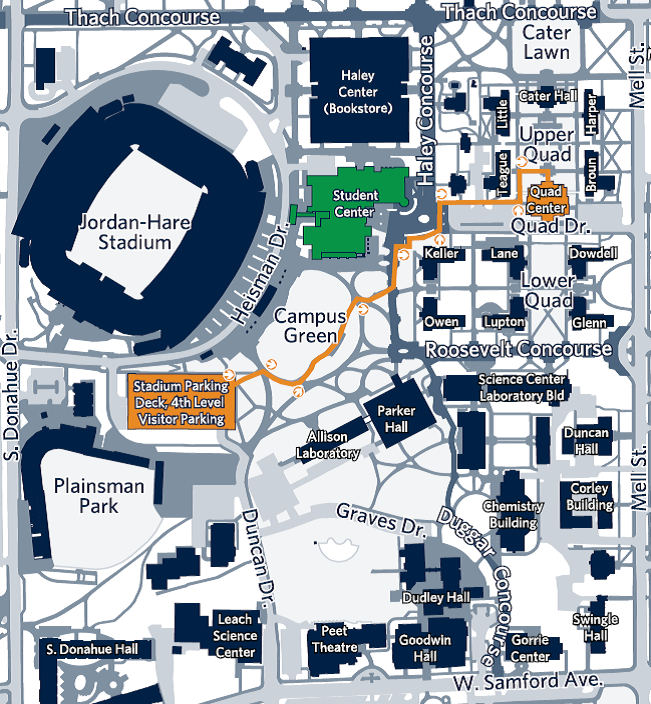 Below is a map of the walking path from the 4th level of the Stadium Parking Deck to the Quad Center for your information. Follow the Campus Tour signs from the Stadium Deck to the Quad Center. Campus buildings can easily be located by using Auburn University’s Interactive Campus Map. Guests with disabilities parking will need a Parking Pass in addition to your handicap parking tag. There are limited handicap parking spaces located at the Quad Center. There are several areas on campus for handicapped parking. The ADA entrance is located on the first floor of the Quad Center. Please take the elevator to the second floor then turn left and follow the hallway around until you reach the front desk of the lobby. For accessibility assistance getting from the parking deck to the Quad Center, please consider contacting the jAUnt service provided by the Office of Accessibility. Please make arrangements a couple of days ahead of your campus visit to ensure that they are able to accommodate your request. Please also be aware that they are not able to provide transportation during the tour. If you have further questions about parking on campus, please contact Parking Services at (334) 844-4143, Monday-Friday from 7:15 a.m. - 4:15 p.m. If you have plans to fly to Auburn, we would recommend either the Birmingham International Airport (Birmingham, AL) or the Hartsfield-Jackson Atlanta International Airport (Atlanta, GA). Driving time from either airport is approximately 2 hours. Note: There is a one hour time change (Eastern Time to Central Time) when driving across the Georgia-Alabama state line. The Hotel at Auburn University and Dixon Conference Center is conveniently located on the Auburn University Campus at 241 South College Street. The hotel phone number is (800) 228-2876. For directions to the Quad Center, please see the front desk upon your arrival. Additional hotel information is also available at www.aotourism.com. The Office of Undergraduate Admissions has a number of Admissions Advisors available to meet with prospective students and families. Advisors are able to answer any questions about admission and scholarships. These advisors are available Monday through Friday from 7:45am to 4:15pm Central Time with no appointment necessary. The Office of Undergraduate Admissions offers Admission Information Sessions Monday through Friday at 8:30 am, 10:30 am, and 2:30 pm - Central Time. These Admission Information Sessions are given during the first 30 minutes of your campus tour and are included in your reserved tour time. No one tells the Auburn story better than our students, and the Student Recruiters do just that. Selected through a rigorous interview process, these student representatives are both knowledgeable and enthusiastic. The recruiters lead walking tours of the Auburn campus four times daily, and are ready to provide a student's point of view of what makes Auburn a truly special place.